With all this snow (and after all the over-eating I did at yesterday’s Christmas dinner), the last thing I want to think about is a bathing suit. 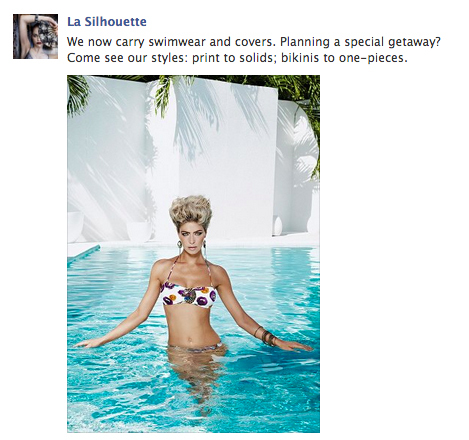 But I follow La Silhouette Lingerie on Facebook and just saw them update about now carrying swimwear and covers. So, if you’re planning a getaway to warmer weather, you now have a local boutique to buy from! (there aren’t any other local boutiques who carry bathing suits that I know of). I’m actually working with La Silhouette on a Bra Fitting Lunch ‘n’ Learn event coming up on Jan. 30 (details below)! Britt, the owner, is so knowledgable (certified in post-surgical fittings too) and fun to work with, so I think the attendees are going to have a great time at the luncheon! Click here to learn more and register! What: A great fitting bra can help you look thinner and better in your clothes, and can even alleviate neck, back and shoulder pain. Join us as experts from La Silhouette Lingerie offer tips and tricks to help you start your new year on the right foot — and in the right bra! Complimentary lunch catered by Stone Creek Dining Co. Hosted by: Cincy Chic, an online lifestyle publication for women in Greater Cincinnati.